An accord between the Holy See and the People’s Republic of China “is almost made” and could be signed in the coming months, thereby opening a new phase in the relations between them, according to a senior Vatican source informed on the secret negotiations between the two sides. The source, who requested anonymity, told America that the negotiations have reached this crucial stage following the visit by a Holy See delegation to Beijing last December when, for the first time since the Chinese communist government expelled the papal nuncio from China in 1951, Vatican officials were able to meet and speak with two bishops from the underground church community. The Holy See’s five-person delegation, led by Archbishop Claudio Maria Celli, who has been involved in Sino-Vatican relations since 1983, traveled to Beijing just before Christmas for another meeting of the Joint Working Group that was established in 2014. The J.W.G. was set up after the two sides signed a framework document of intent regarding the nomination of bishops. It was tasked with resolving the various problematic elements in that text. Since then, it has met around 12 times, alternately in Beijing and the Vatican. In previous sessions, it reached agreement on most of the key issues in the framework text, including the most important one for the Holy See: that the pope shall have the final say in the nomination of bishops. An accord between the Holy See and the People’s Republic of China “is almost made” and could be signed in the coming months. One of the most contentious problems that remained to be resolved, however, related to the seven Chinese bishops (originally eight but one died) whom the Holy See considers illegitimate because they received episcopal ordination without the papal mandate, in breach of canon law. Indeed, three of them were formally excommunicated for this. Chinese Catholics, moreover, raised questions regarding the moral suitability of two of the seven. From the start of negotiations, the Chinese insisted that all seven had to be legitimized and recognized by the Holy See as the ordinary bishops of their respective dioceses. After considerable reflection and investigation, the Holy See concluded that it could recognize all seven. Pope Francis is expected to sign a decree that lifts the excommunication on the three bishops subject to such penalty, grants pardon to all seven illicit bishops and recognizes them as legitimate bishops in the Catholic Church and as ordinaries in the seven dioceses where they now reside. America has learned that already each of the seven bishops has asked the pope for pardon and has requested reconciliation with him and the universal church. But there was still a problem to be resolved: Two of the seven are in dioceses—Shantou and Mindong—where the so-called underground church community is much larger than that of the open one and is led by two highly respected underground bishops, Msgr. Peter Zhuang Jianjian and Msgr. Joseph Guo Xijin. Both dioceses have official and underground bishops today. To resolve the problem regarding the leadership of those dioceses, it was necessary for the Holy See’s delegation to meet and present the proposal to the two underground pastors and, if possible, gain their acceptance of it “for the good and the future of the whole church in China.” The Holy See’s proposal invited Msgr. Zhuang, now 88, to resign and make way for the illicit Msgr. Huang Bingzhang to become bishop of Shantou diocese. Likewise, it invited Bishop Guo Xijin to step down and accept to become auxiliary or coadjutor to the illicit Msgr. Zhan Silu in Mindong diocese. Each of the seven illicit bishops has asked the pope for pardon and has requested reconciliation with him and the universal church. To facilitate the realization of the first proposal, Chinese local government officials escorted the elderly Msgr. Zhuang to Beijing, Dec. 18-22. They brought him from a village in Shantou diocese, in the southern Guandong province, where he has been confined since his ordination as underground bishop in 2006; it was his first time outside his village since then. On Dec. 21, a Chinese priest, a member of the Holy See’s delegation, took him to meet Archbishop Celli and the other delegates. The archbishop prayed with him and then explained the proposal and added that Beijing has agreed to recognize him as emeritus bishop of the diocese (hitherto it had refused to recognize him as bishop) and has given assurance that it would not have him sign any document regarding the independence of the church. To say it was a hard moment for the elderly bishop is an understatement. He had already suffered much for his loyalty to the pope and now was being asked to step aside and let one who had disobeyed the pontiff become bishop. He cried but said he was willing “to do God’s will” and to “obey the pope.” But when he returned home, sources said, he seemed to have second thoughts. To address the second proposal, Bishop Guo Xijin, a relatively young man who had been detained for a month in 2017, traveled from the Diocese of Mindong in the eastern Fujian province to meet the delegation from Rome. The Vatican archbishop explained to him that for the greater good and future of the church in China, the Holy See invited him to accept the illicit Bishop Vincent Zhan Silu as bishop of the diocese and to agree to serve as his auxiliary or coadjutor. Bishop Guo Xijin, who has 60 priests of the diocese with him, while only six are with Bishop Zhan Silu, expressed his strong disagreement with the proposal but said he would obey and do whatever the pope wanted. It was again a painful moment of obedience for a man who had already paid a price for his loyalty to Rome. Asianews published a substantially accurate account of what happened in these discussions. 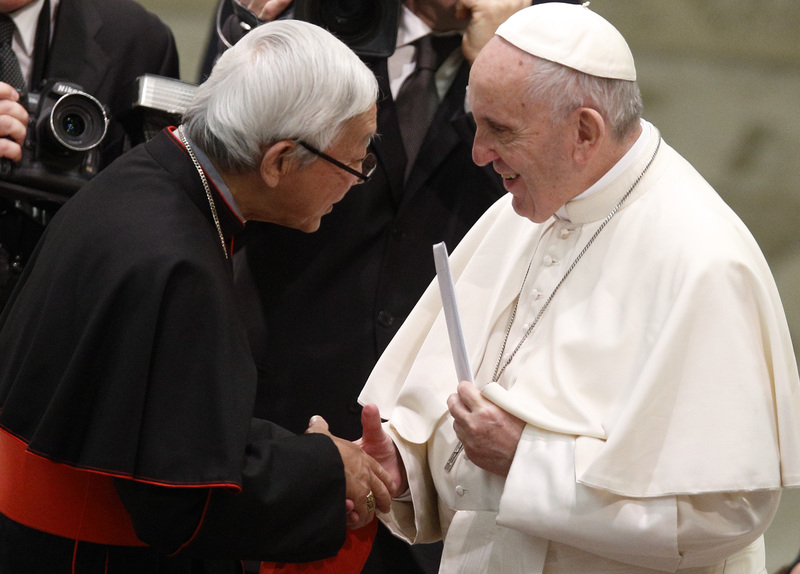 Cardinal Joseph Zen, the former Bishop of Hong Kong, provided additional information and comment in his blog on Jan. 30, revealing what happened in his private half-hour conversation with Pope Francis on Jan. 12. Both accounts, but especially the cardinal’s one, received wide publicity and raised the question: What price has the underground church to pay for the Sino-Vatican accord? The cardinal considers the Holy See’s requests to the two underground bishops to be a betrayal of the underground church. In his long interview with Vatican Insider on Jan. 31, however, Cardinal Parolin denied that the Holy See’s approach risks erasing the past and present suffering of the faithful in China. In his blog in Chinese and English, Jan. 30, Cardinal Zen revealed that Bishop Huang had asked for his help after receiving a letter from the Holy See last October requesting him to resign and make way for the excommunicated bishop. Cardinal Zen said he received a letter from the bishop and sent it to Rome. But when the bishop contacted him again after the December meeting, he decided to travel to Rome on Jan. 9 and place the letter in the hands of the pope. What price has the underground church to pay for the Sino-Vatican accord? Cardinal Zen in his blog suggested that those handling the negotiations with China are not always on the same page as the pope. Cardinal Parolin, the secretary of state and the main architect of the negotiations, denied this in his interview with Vatican Insider and stated categorically: “The Holy Father personally follows current contacts with the authorities of the People’s Republic of China. All his collaborators act in concert with him. No one takes private initiatives. Frankly, any other kind of reasoning seems to me to be out of place.” Cardinal Zen’s statement provoked much reaction inside and outside China and upset top Vatican officials. It led to a declaration from the director of the Holy See’s press office, Greg Burke, flatly denying any rift between the pope and his collaborators. Indeed, confirming this, a source told America that before the delegation went to Beijing last December, Archbishop Celli spoke with Francis about its mission and what it intended to do there and on his return gave a full report to the pope. It is now clear that the delegation’s meeting in December with the two underground bishops was a crucial one. It is now clear that the delegation’s meeting in December with the two underground bishops was a crucial one. It gained the “suffered” acceptance by the two underground bishops of the Holy See’s proposals, in obedience to the pope, and thereby opened the door to the next significant step in the rapprochement between the two sides, which is likely to take place when the J.W.G. holds its next meeting, this time in the Vatican, sometime after the celebration of the Chinese New Year (Feb. 16 to March 2). The date has not yet been set. Cardinal Zen has said that “no accord is better than a bad one,” but the Vatican source does not agree. “I think it’s better to have an accord. It opens the door,” he said. At the same time, even he is not certain that the agreement will be signed because there are those who do not want it to happen, not just in the Catholic Church but also in the People’s Republic of China. “I will believe it when I see it!” he added. Since becoming pope in March 2013, Francis has actively sought an accord with China, and following in the footsteps of his Jesuit predecessors, St. Francis Xavier and the Jesuit missionary Matteo Ricci he is prepared to go the extra mile to reach it, convinced that the future of the church is in Asia. The signing of an accord would represent a major breakthrough in Sino-Vatican relations, because for the first time the Holy See is signing an accord with the government of the People’s Republic of China. Up to now, Chinese officials have always insisted that there should be “no interference in the internal affairs of China,” but the proposed agreement provides a different understanding of that declaration. Its signing would reflect a significant change in how China views the Catholic Church. In the 16th and 17th centuries Catholicism—and especially the Jesuits—were respected in China, in the following centuries the church was seen as allied with the foreign powers that humiliated China, and still today in the eyes of many at the political level it is viewed in this light. An accord therefore opens the possibility to a better understanding of the nature of the Catholic Church and to exchanges at the cultural and geo-political levels. The accord would reflect a significant change in how China views the Catholic Church. Above all, it opens the path to a new life for the Catholic Church in China and the overcoming of divisions that were caused within it by the political interference of the state. There are about 100 dioceses in China: 98 according to the government, 144 (112 dioceses plus other administrative regions) according to the Holy See. There are more than 100 bishops in China today (around 70 of them in the open church, and some 30 in the underground), and all but seven of them—the illicit seven—are now in communion with the Holy See and serving an estimated Catholic population of between 10.5 and 12 million faithful. Today, however, more than 40 dioceses are without a bishop, while many others are governed by pastors over the age of 75, with some even over 90. The Holy See pushed hard for this accord for several reasons, including the fact that it feared that if it did not reach an agreement on the nomination of bishops there was a high risk that Beijing would appoint its own bishops to the vacant dioceses and thus compromise the future of the church in China, as well as the possibility of reconciliation between the underground and open communities. No one in the Vatican believes the accord will resolve all the problems of the Catholic Church in China or in Sino-Vatican relations. But it is considered a necessary start for the building of mutual trust and understanding. It should be noted, however, that the accord will not abolish the state structures that control the church in China today or the democratic election of candidates to be bishops; they all remain in place. Moreover, myriad important questions will still need to be resolved. These include: the situation of almost 30 underground bishops and their communities, the release of the two bishops that disappeared several years ago, the recognition of the bishops’ conference and agreement on the number of dioceses, the situation of Bishop Ma in Shanghai, the possibility for Chinese bishops to visit the Vatican and for the Holy See’s officials to visit Catholic communities in China, and for the Holy See to open an office in Beijing for relations with the government and the church in the mainland. It is important to mention, too, that the question of diplomatic relations and the question of Taiwan have not been addressed so far in the negotiations between China and the Holy See. They are not yet on the agenda, nor is a visit of Pope Francis to China on the horizon. "he is prepared to go the extra mile to reach it" and "It is the best we can get at this moment" simply mean to surrender to an anti-religion Communist dictator who will become the Leader of a Communist Catholic Church in China. Saint John Paul II must be whirling in his grave at that thought that we now have practicing Communist Pope in the Vatican. When the Cardinals selected the new Pope Francis my first concern was that he was a Jesuit. The Jesuits in general were the leaders of the Communist inspired armed "liberation" theology and I met several when working in South America 30+ years ago.Today Francis and the Jesuits substitute socialist, communist, government control/ intervention/anti-business theology for guns and Marx/Lenin and now Mao for Jesus Christ. Parachuting in with a short comment like this is unworthy of my principles. Still, I'll do so. A much better comment I have written and can be found (if interested) printed in the current WSJ's article: 2/2/2018. Yes, charity: "Deus caritas best." That said & uppermost, while honoring and praying for the current Bishop of Rome & living as I have as far back as the Pontificate of Pius Xll, I question seriously this pope's decision bowing to the selection of an episcopacy chosen by the governing power of China. Matteo Ricci, ora pro nobis. For most of Church history, the Pope relied on the approval of kings and other national leaders as an important part of the selection process for Bishops. Only in the modern age, where quick communications across borders became possible, did the Pope take full charge of the selection process. Reconciliation between the official and underground Catholics in China is wonderful news. Rapid Evangelism may now be possible. China and the Vatican are cIose to betrayaI. A IittIe honesty is in order. Jesuits, named after Our Savior, and so corrupt. Disgraceful and dismaying. I have very mixed feelings about the reaching of an accord between the Church and the Chinese government. I certainly realize that in past centuries bishops were essentially appointed by the Pope with the approval of kings, and so it's now totally unacceptable that the Chinese government in my view have any role in the appointment and confirmation of bishops. Although it's very unfortunate that two bishops of the so-called underground Church are vacating their sees to bishops of the government church, I do believe this should be accepted to encourage cooperation between the Chinese government and the authentic Catholic Church. Also, I believe that before an accord is signed that the two bishops who have "disappeared" just be accounted for and found to be safe and if imprisoned just be released. Finally, it would be ideal if the bishops in China could visit the Pope at the Vatican for discussion of the state of the country's Catholics, and if Vatican officials could make visits to Chinese bishops on a agreed upon timetable. However, I do think that this ideal situation could be deferred until future negotiations. Regarding the Church in Taiwain, I need more information to make any comments. Finally, I do think it would be beneficial if Pope Francis was permitted to visit China. This would both be an opportunity for him to encourage the Catholics of the "underground" Church, as well as hopefully improve relations between the Vatican and the Chinese government . One important matter that wasn't mentioned is the inhumane practice of Chinese officials forcing in at least some cases pregnant women to have abortions. Undoubtedly, the Chinese government would see this as an intrusion on their internal affairs. However, I think Pope Francis should speak out against this human rights violation, despite the probable negative consequences for Catholics.